Early Cycladic sculpture has captivated scholarly and popular imagination for centuries, originally as “crude” and “ugly” representations of a bygone era, and later as “collectables” and “works of art” praised for their abstract form and beauty, inspiring artists such as Picasso, Modigliani and Brancusi. Since the late 19th century, sculptures of this period have been praised in their own right, for providing archaeologists with important information for the better understanding of the societies that produced and made use of them. No matter how we choose to look at Early Cycladic sculpture, however, we can no longer deny that the pressure of the art market has led—for more than a century—to its extensive looting and the production of numerous forgeries. With the destruction of the archaeological context, knowledge has been irretrievably lost. It is for this reason that, to this day, we know so little about these objects, with many problems still surrounding their chronology, function and meaning. Colin Renfrew, one of the three editors of Early Cycladic Sculpture in Context, has for decades spearheaded the awareness campaign that “context matters”—a shared tenet among archaeologists but one that is often less appreciated outside the field. This beautifully illustrated volume, with almost 500 images and drawings of Early Cycladic sculpture—most published for the first time and systematically illustrated at a scale 1:2 for comparison—attempts to rectify the issue. Twenty-nine chapters examine the origins of Early Cycladic sculpture, its presence in settlement and cemetery contexts, and its material, technique and manufacture. Six more chapters are dedicated to the important sanctuary at Kavos on the island of Keros, which Renfrew and Michael Boyd have been reinvestigating systematically with tremendous results over the past decade. This book provides the reader with an astonishing wealth of new information, difficult to sum up in a brief review. Early Cycladic sculpture in context was previously known mostly from tombs and the special deposits on Keros. When discovered in settlements, it was regarded as “circumstantial and fortuitous”. However, the ever-increasing amount of Cycladic sculpture from settlements across the islands—notably Skarkos on Ios, and on Dhaskalio (the two largest-known Early Bronze Age settlements in the Cyclades)—starts to paint a different picture. Marisa Marthari, herself a distinguished archaeologist of the Cyclades and a co-editor of this volume with Renfrew and Boyd, offers an important contribution with her detailed contextual analysis of figurines in the cemetery of Chalandriani on Syros. 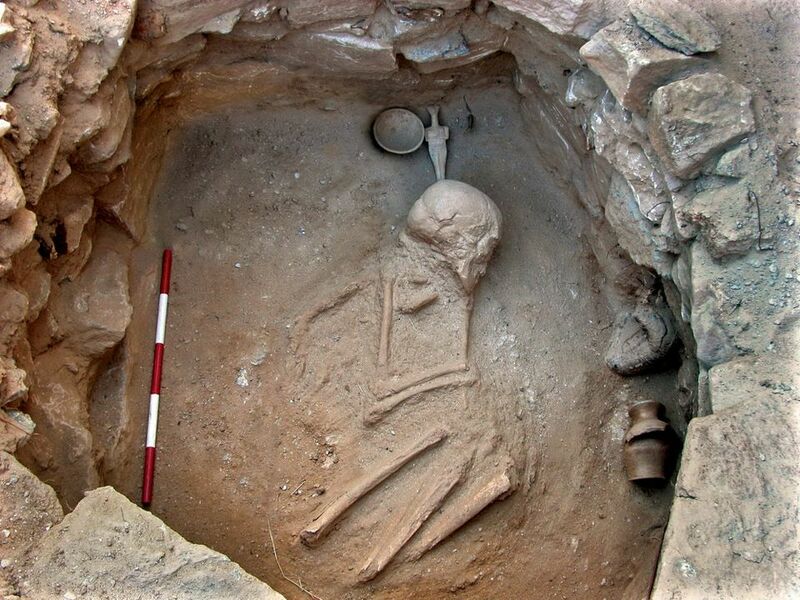 Her study shows that, at least at Chalandriani in the mid-third millennium BC, figurines were rare—only 22 are known from the 727 excavated graves, and this picture does not seem to be the result of looting. Similar studies, included in this volume, add weight to the conclusion that figurines were actually infrequently deposited with the dead. Careful contextual analyses, like the ones in this book, allow us for the first time to learn about the handling and deposition of these objects, and to appreciate the differences between the Cycladic communities in the selection of their grave goods. As Marthari argues, their choices might reflect the greater availability of certain kinds of material (for example, white marble) in an individual community, or echo the structural peculiarities of each community. The valuable re-examination of material from old excavations allows us to revisit Early Cycladic burial practices on the basis of secure archaeological data, leaving aside “unprovenanced” objects and forgeries. The book includes a particularly striking contribution from Yiannis Papadatos and Epaminondas Venieris on the experimental approach to the manufacture of Cycladic-type figurines. These can be made with only two materials, marble and emery, and could be produced almost anywhere. Papadatos and Venieris observe that the manufacturing procedure is mostly a technical, rather than an artistic, process. Wearisome as this task might have proved, their experiment has the following implications: that the manufacture of these figurines was easy, relatively speaking, and that it did not require specialised, full-time sculptors or organised workshops, as hitherto thought by some scholars. It also suggests that faking such objects in modern times—notwithstanding the skill required—might have been an easier task than was previously believed and is currently acknowledged. The editors and authors of this volume must be congratulated not only for the much-needed filling of a gap in our knowledge but also for their tremendous efforts in highlighting once more the importance of archaeological context. Before now, we have been greatly deprived of this in relation to Early Cycladic sculpture. We can only hope that the two other volumes (Early Cycladic Sculpture in Context from beyond the Cyclades, and Cycladica in Crete) will be published soon, so that we can have as complete a record as possible of these objects from secure contexts. Together, the volumes will undoubtedly change the way we talk and think about Early Cycladic objects—because context matters.